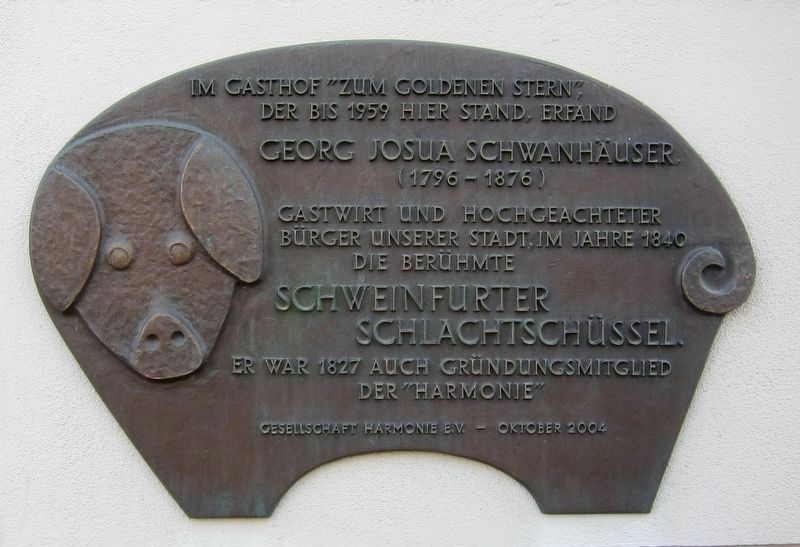 At the “At the Golden Star” Inn, which stood here until 1959, the innkeepper and esteemed citizen of our city, Georg Josua Schwanhäuser, 1796-1876, invented the famous Schweinfurt "Slaughter Pot" in 1840. He was also a founding member of the Harmonie Association in 1827. Erected 2004 by Gesellschaft Harmonie e.V. Location. 50° 2.78′ N, 10° 14.034′ E. Marker is in Schweinfurt, Bavaria. Marker is on Obere Strasse, on the right when traveling north. Touch for map. 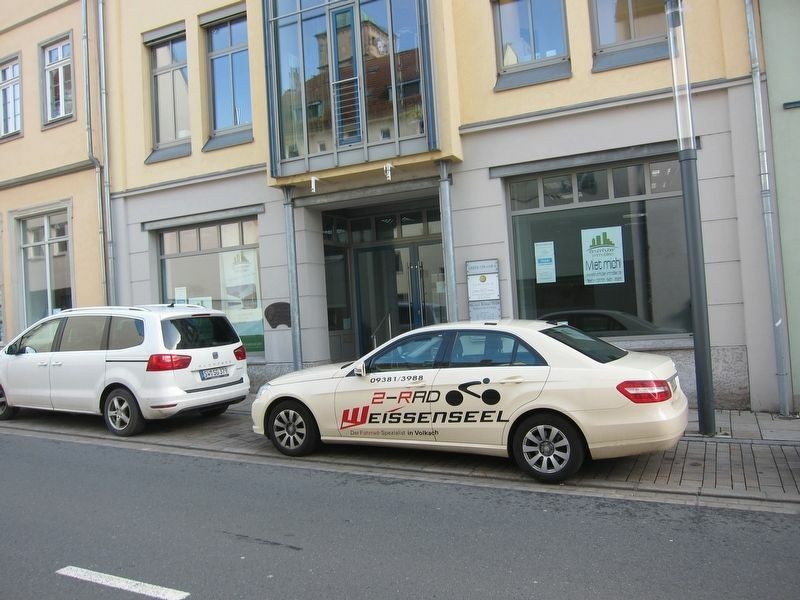 Marker is at or near this postal address: Obere Strasse 6, Schweinfurt, Bavaria 97421, Germany. Touch for directions. this marker); Dr. Martin Luther (about 120 meters away, measured in a direct line); Raven Hotel / Hotel zum Raben (about 150 meters away); Ehemalige Rückert-Buchhandlung / The Former Rueckert Bookshop (about 210 meters away); Olympia Fulvia Morata (approx. 0.2 kilometers away); Professor Theodor Fischer (approx. 0.3 kilometers away); Engelbert Fries and Wilhelm Höpflinger (approx. 0.3 kilometers away); Städt. Sparkasse / Municipal Savings Bank (approx. half a kilometer away). Touch for a list and map of all markers in Schweinfurt. Regarding Schweinfurter Schlachtschüssel / The Schweinfurt “Slaughter Pot”. The Schweinfurt "Slaughter Pot" is not so much a specific dish, but is rather a cultural and culinary experience specific to Schweinfurt and its surrounding area, wherein a number of pork dishes (liverwurst, blood sausage, pork belly, and various bits and pieces of the pig) are served family-style at the table, to the accompaniment of hard liquor and the singing of various folk songs tailored to the occasion. The phrase "at the table" barely covers it, as the dishes are more or less served directly onto a large wood board laid on top of the table, without anything so intermediary as a serving dish to interrupt the experience. More. Search the internet for Schweinfurter Schlachtschüssel / The Schweinfurt “Slaughter Pot”. Credits. This page was last revised on March 20, 2019. This page originally submitted on March 16, 2019, by Andrew Ruppenstein of Sacramento, California. This page has been viewed 49 times since then. Photos: 1, 2. submitted on March 20, 2019, by Andrew Ruppenstein of Sacramento, California.